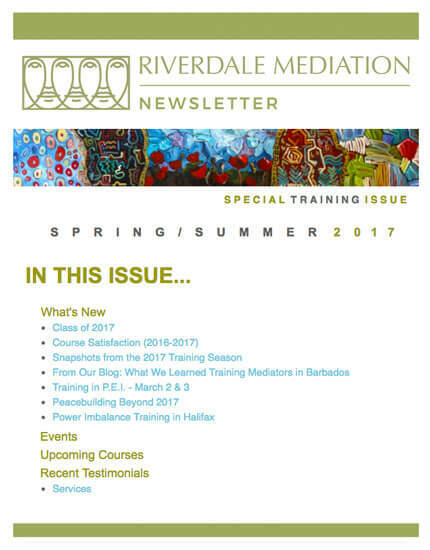 Riverdale Mediation has been training mediators since 2001. We have trained family mediators in Toronto, across Ontario, across Canada, as well as in several European countries, South Africa and in many US states. We are specialists in designing and delivering custom-training for professionals. Although our focus is on providing the highest quality and most affordable family mediation training, we have also designed and delivered civil and community mediation training, negotiation workshops, conflict management session and conflict coaching training. We have a unique expertise in helping professionals identify, assess and manage safety and risk in their practices, with a focus on the impact of negotiation power, including domestic violence, in the work of all mediators. Our training and consulting in the field of safety planning for mediators, lawyers and other professionals and clients is renowned. Control over the process AND the outcome. Going to court means using a process that is based on the principles of adversarial lawyering. It is complicated, difficult and time-consuming. It also means accepting the decision of a judge—someone who does not know the family—which can be taking a big risk. In family mediation, the separating couple chooses the professional – someone they respect and trust. They and the mediator choose how and when they will meet, what process they will use and what decisions they will make. In other words, family mediation is a process of self-determination, and that feels more empowering and respectful for many. Family mediation is faster. Going to court can take years. The uncertainty and continued conflict takes a huge toll on families. The cost can be devastating for families. Family mediation can result in a settlement in months, weeks or, if the couple is ready, the same day. Family mediation is generally less expensive. There are many reasons why mediation, even with lawyers present, often costs less than lawyer-led negotiations or court. The bottom line is that, sadly, people often come to mediation after they have spent large sums on a legal fight. It would be so much better if they had come to a mediator first! Family mediation keeps your personal information private. In most cases, family mediation is confidential. Not so the legal system, where court files are accessible to anyone who asks for them. (keep the same link). Family mediation helps preserve positive working relationships between parents. In most cases, separating couples will need to co-parent their children for many years. A good working relationship with one’s ex-spouse goes a long way towards helping parents and children start their lives on a new road. Family law mediation helps parents separate with dignity, which in turn helps them function as better parents. Mediation supports the “best interests of the child” principle, which is the basis of Canadian family law. As a well-trained family mediator, you will play a crucial role in helping separating couples untangle their former lives as a couple and move forward separately. The skills you need — understanding conflict, knowing how to identify negotiation power, understanding negotiation strategies and tactics, assessing and managing risk, knowing family law, and possessing effective communication skills— you will learn in our training program. Read more about our family mediation training and internship programs. Our Family Mediation Certificate training is our best known and longest-running program. All of our courses are approved by the Ontario Association of Family Mediation and the Family Dispute Resolution Institute of Ontario, and are also accepted by the ADR Institute of Ontario. View our family mediation courses.